When I got to the Lang Dong Bus Station, a bus to Hanoi was just pulling out. I bought a ticket on the next bus and went downstairs to the KFC and had breakfast. I got some water and snacks from one of the “mini-mart” stands near the waiting area. If you take this bus, make sure to use the bathroom before you get on. There is no bathroom on the bus and the first rest stop is a good 2 hours away. I made sure that I was the first person on the bus. I might have even annoyed the gate attendant by constantly asking, “Can I get on the bus now?” I wanted a seat in the front row. If this bus were to crash, I wanted to see it coming. Before we pulled out of the station they handed everyone a bottle of water and a barf bag. Then they played a Hong Kong action/comedy with English subtitles. I couldn’t watch it because reading on buses makes me nauseous, but at least it wasn’t one of those horrible loud music videos. Before traveling to China I went to my bank in Korea and got some money changed into yuan, euros, and pounds. They didn’t have any dong or tögrög (Mongolian money). But at the border, right before going through the Chinese immigration check, there were money changers. They surrounded us and told us about the great rate they would give us. They spoke in Chinese, English, Vietnamese, and French. I thought about changing some yuan into dong there, but there were so many of them and they were yelling at me all at once. It was a bit intimidating and I wasn’t sure about how legal changing money on the street was. (In many countries changing currency while not inside a bank is illegal.) So I entered Vietnam with no dong to my name. I think one of the most enjoyable things about traveling in Vietnam is being able to constantly refer to their money as dong, which is pretty much what it’s worth. 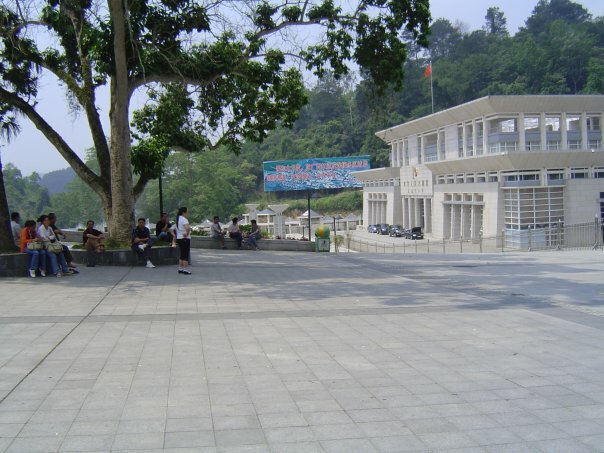 The Chinese border is on the eastern end of Pingxiang. There we got off the bus and into a glorified golf cart, provided by the bus company. It drove us up to the entrance of the Chinese immigration building. We went in, filled out a form, and stood in line. Everything was somewhat orderly. When we came out the other end the “golf cart” was waiting for us. Some people chose to ride in the cart, others walked to the Vietnamese immigration check on the western end of Dong Dang. 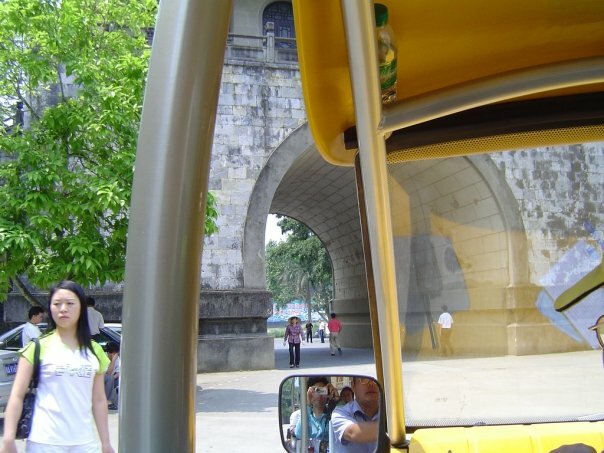 The cart cannot enter Vietnam, so those who rode in the cart had to walk part of the way anyhow. In the Vietnamese immigration building it was a mad free for all. I had no idea what to do. I had to push and shove my way to the front of the crowd to ask questions. The man behind the glass window handed me a form to fill out. He didn’t say a word to me or even look up from his paper work. I had to hand in my passport along with the form. The officer doesn’t just take your passport; you have to almost sneak it into the pile of passports on his desk. 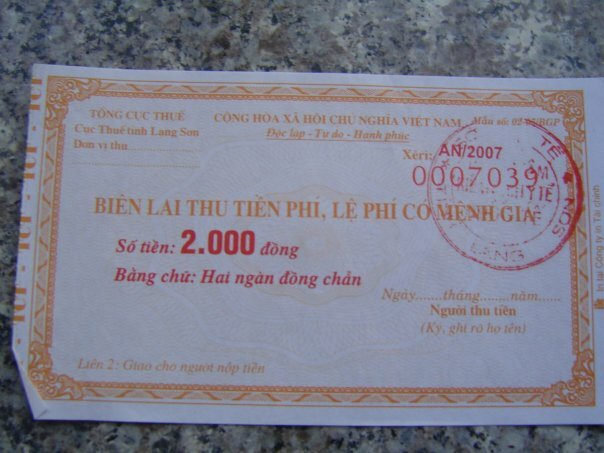 Anyone with a Vietnamese passport can jump the line by placing their passport on the top of the heap. There really isn’t an actual line, just a line-like form of chaos where people crowd around and yell until they get to go next. I watched as he worked on his pile with my passport in the middle. Vietnamese people who had just arrived would toss their passports at him and quickly get it returned to them. Eventually my passport made its way to the top of the pile. When he was about to pick up my passport and check my visa to let me through, his co-worker plopped a mountain of passports on top of mine. That moved me to the back of the “line”. I thought of some excuse, like, “I forgot to write the date” to get my passport back. I pretended to write something on the form and I put it back on top of the pile. This enabled me to skip all those people and move onto the next section of the immigration check. This proves that I’m healthy. Next was the health check. Vietnam wants to keep out contagious diseases so they do health checks to make sure that people don’t bring in any. They do this by charging you 2,000 Dong or 2 Yuan then giving you a piece of paper that says you’re healthy. There is no actual doctor nor is there any screening for any disease or virus; just a piece of paper. After my unceremonious entrance into Vietnam I looked for my new bus. My old bus went back to Nanning taking the people who came in from Hanoi. I found the new bus. It was significantly smaller than the Chinese bus. Because I was among the last to get on the bus, my new seat was in the last row next to a very fat man who kept trying to use me as a pillow when he wasn’t throwing up. How that man slept through all those pot holes and horrible, loud Vietnamese pop songs I just don’t know. I do have a theory on why he threw up so much. Just like the bus in China, the one in Vietnam also provided us with drinks. But instead of water, we were handed cans of… well, I’m still not sure what it was. It might not have even been a drink at all. It could have been soup or dessert. What ever it was, the picture on the can didn’t spark any feelings of thirst or hunger in me. I handed mine to the fat man since he seemed to thoroughly enjoy his own wonky beverage. He showed his appreciation by chugging the drink in one go and smiling ecstatically afterwards. So, I guess his getting sick was, on some level, partly my fault. I made it up to him by unwillingly catching his head with my shoulder every time he dozed off. Don’t worry if you cannot get Vietnamese dong from your local bank back home. You can get your dong at the airport either in your country or in Vietnam. Don’t get too much; no one will buy it back from you. Many hotels, fancy restaurants, and tour agents will take US dollars or Euros. Though, who knows what exchange rate they will use? You will need dong for taxis, small shops, and local restaurants and vendors. The bus station is called Lang Dong Bus Station. 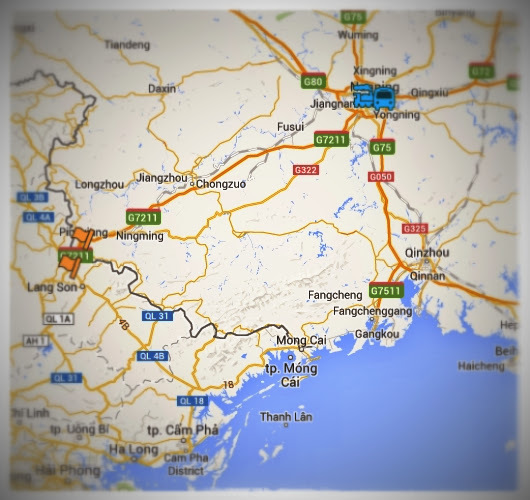 You can get there from Nanning Train station by taking city bus #6. The city bus costs 2 Yuan. There might be more buses that go between the train station and the bus station, but the #6 is the one that I know. Once at the bus station you can buy a ticket on the next available bus out. They seem to run every two hours or as they fill up. 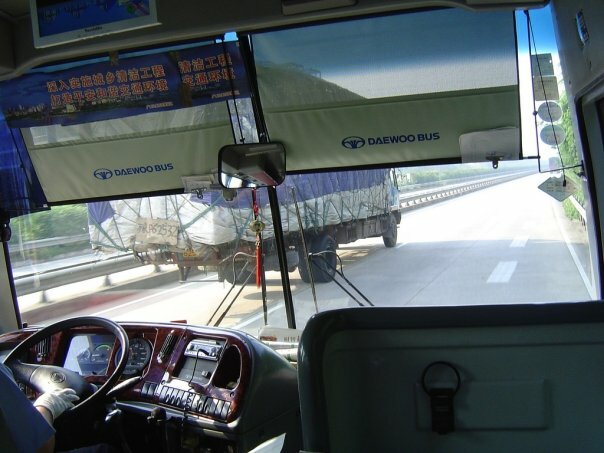 There will be empty seats on the Chinese bus because the bus in Vietnam is much smaller. You change buses at the border, so the drivers never leave the country. The ticket costs 150 Yuan. The ride is about 7 hours, but it will seem longer than that once they start to play the horrible Vietnamese pop music and the guy next to you starts throwing up in the aisle. I heard the Hanoi-Nanning train is worse, though I can’t see how. I recommend getting someone to write a note for you stating that you want bus tickets to Hanoi. Make sure to bring your own pen. They do not have pens at any of the border controls and you will need to fill out a few forms. 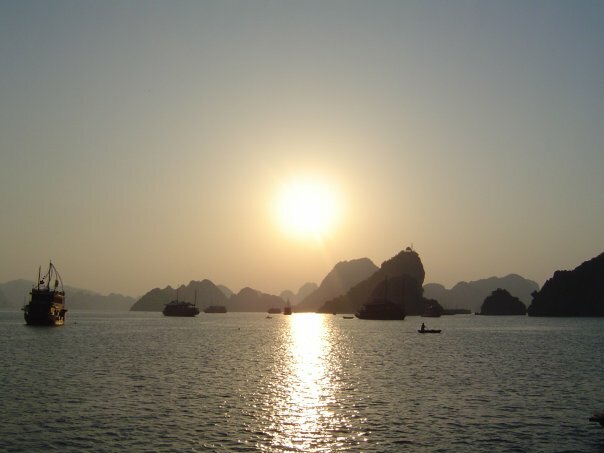 Depending on what country you are from, you should get your visa before going to Vietnam. As an American, I needed to have a visa before entering.